To show Audi A8’s perfect noise insulation, Café Communications tested the car in a real environment. The world doesn’t stop when you get into your car, but the new Audi A8 grants you the freedom to concentrate on the essentials. 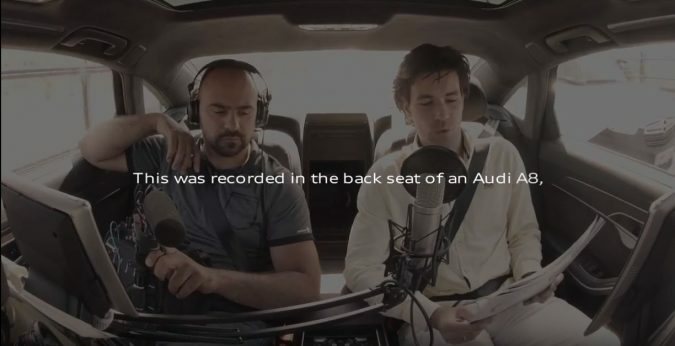 To show Audi A8’s perfect noise insulation, Café Communications tested the car in real environment and recorded the radio commercial in the back seats of an Audi A8, in the morning traffic. The radio was recorded without any post audio effects, just a voice actor and a sound engineer meanwhile driving in the morning traffic for real to show the perfect sound insulation. “We had a test drive when the Audi A8 was launched, and the perfect noise insulation was incredible. We wanted to show and use this benefit, but first we had to solve a big challenge. We had to build a special mic stand to mount a studio microphone in the car. ” – Gábor Szűcs said. Client: Porsche Hungaria Kereskedelmi Kft.